Sutherland is in Top 3 employers providing the best office space for its employees in Bulgaria. The Jury of the prestigious career forum for Bulgarians with experience abroad “Careers in Bulgaria. Why not? ” evaluates different criterias, to award the best companies in terms of office space. The forum was held under the patronage of Mr.Rumen Radev, President of Republic of Bulgaria on 20th September at Inter Expo Center in Sofia. The company was awarded for its excellent location, the modern and creative environment, which Sutherland provides to its over 2500 employees in all five locations in Bulgaria. Sutherland provides to its employees in Bulgaria excellent working environment, attractive social benefits package, great location and recreation areas. “We are proud of the “Best office space” award in this years` forum “Career in Bulgaria. Why not?”. We are especially thankful to receive an award in this category because our employees come first and we our mission is to provide them with an exellent working environment. It is great when our efforts gain recognition”, commented Dimitar Galabov, Site head for Bulgaria. 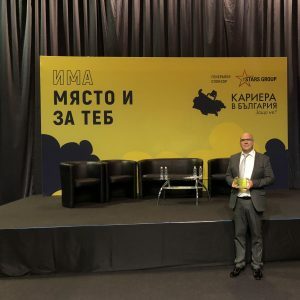 During the forum, which included more than 100 top employers in Bulgaria and more than 1,500 candidates with working experience abroad, Sutherland presented the excellent career opportunities in the company, its unique German Language Academy and the latest training initiative – the TechStep Technical Academy. The forum “Careers in Bulgaria. Why not?” is organized by “Back2Bg” and “Tuk-tam” association with the goal to inform Bulgarians abroad about the opportunities in the country. The initiative started in 2008 and since then it has traditionally brought together leading Bulgarian employers and students, specialists and entrepreneurs who strive to build a career in their home country.